Hanoi (VNA) - Handwritten letters of the Vietnamese people during the last hundred years are on display at an exhibition in Hanoi. The exhibition is hosted by A Letter Home, a homestay accommodation provider, a space of patisserie, café and books. This is very different from art exhibitions because visitors can spend an entire day reading hundreds of letters in Vietnamese, English and French, sent by intellectuals, artists, writers and people in a family. Some of them are love letters while some are official documents. 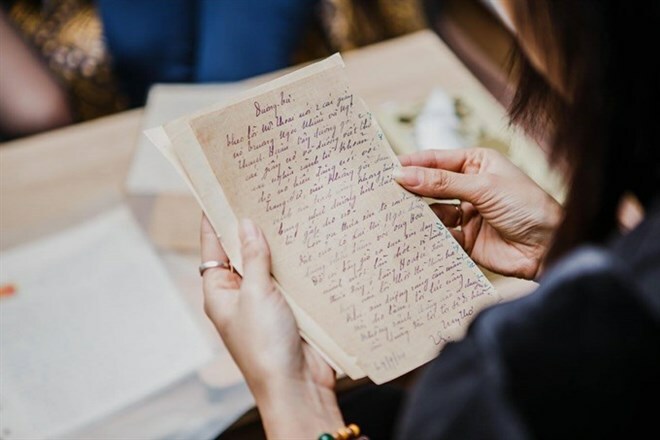 “Handwritten letters could very well be the most beautiful means of communication between humans,” said Nguyen Da Thuong, 30, owner of A Letter Home. “They not only store information but also lessen conflicts between us,” Thuong said. Thuong collected these letters for many years as she had a passion for collecting old books. The oldest letters in her collection date back to 1905. They are words of a labourer sent to a landlord to ask for an extension of time to repay his debt. Visitors can read stories of poet Mong Tuyet (1914-2007), the first female poet to publish poems in the Vietnamese language, and her friends; letters between scholar Vuong Hong Sen (1902-96) and Vietnamese and French intellectuals at his age; and letters of poor writers of the Tu Luc Van Doan (Self-reliance Literary Group, a literary movement that produced the first modern novels in Vietnam and initiated a new poetry shaped by nationalist and anti-colonial sentiments in 1930s) expressing their difficulties and asking for annuity. “A typed writing can help a writer tell the lie but a handwritten letter can’t hide the emotion and feeling of the writer,” musician Quoc Bao said. “We can know one’s personality and characteristics through hand-writings,” he said.